A few weeks ago, during International Book Week, I went to a Q&A with Neil Gaiman at Liverpool University. I’m probably one of the few people left on the planet, that hasn’t read any of his work (although I have seen Coraline), and yet listening to him speak had a particularly inspiring effect on me. (As well as prompting me to add all of his books to my TBR list). He read from his book of short stories and then he sat down and worked his way through a pile of questions that had been collected before the event. There was of course, the usual question asking for advice to aspiring writers (and the accompanying mirth at his response “write”). It wasn’t really the answers to his questions that inspired me, however. It was the vast body of work he had created. Not just his full length novels for adults, or his short stories, but there’s the children’s books and the scripts for TV and film. Don’t get me started on him co-writing with one of my absolute favourites, the late, great Terry Pratchett. 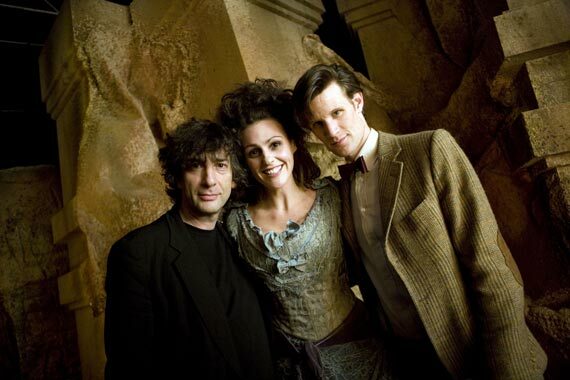 He even wrote one of my favourite modern Doctor Who episodes (The Doctor’s Wife). I left the auditorium and sat with my friend and fellow author, Mark Murphy, in a nearby bar and I thought about all the various things I’ve written over the years. The illustrated children’s book, The Moggins, self published as Helen Anne, my full length Adult Romance, Inspired by Night published by Xcite Books as L. E. May and the current project: a comedy Sci/Fi novel, which I hope to publish (self or otherwise) as Helen P. Stephens. I always imagined it would be sensible to use different names, for a variety of reasons, to differentiate the works. But there’s a lot of effort that goes into maintaining different identities – especially on social media. I had approached each project as a separate stand alone piece of work, but they all form part of my writing experience and I made the decision to pull it all together. It’s not just changing by name, but claiming ownership of everything I’ve ever written and made available to the public. I made The Moggins available for Kindle but I’m having the illustrations redesigned, to reflect the changes I’m making to my public identity (I had originally wanted to avoid confusion between myself and the much more renowned children’s author Helen Stephens, who isn’t me). As soon as they are ready I’ll be updating the current book and looking into print-on-demand options, along with finally getting round to writing the follow up story. I just want to write. And what I’ve learned from Neil Gaiman, is that to be a writer, I have to write. Oh I loved The Ocean At The End Of The Lane. You should read that! And his children’s books are good to! He talked about writing The Ocean At The End Of The Lane during his Q&A. I’m convinced. As soon as I finish editing, I’ll get cracking on reading it.